Amelia Stamps is a full-time studio potter and owner of Stamps Pottery. She received her Bachelor of Fine Arts degree from the University of North Carolina in Asheville. She also completed two one-year apprenticeships with regional ceramic artists in North Carolina. Since then she has been selling her work by traveling to art and craft shows, establishing wholesale accounts and exhibiting in galleries across the nation. Twice a year she attends wholesale shows such as the Buyer’s Market of American Craft in Philadelphia where she directly sells her work to gallery owners. Because of this gallery support she is able to do what she enjoys most, creating work in her studio. Recently, she and her husband Hunter received a ceramic tile mural commission that was installed at Camp Aldersgate in Little Rock, Arkansas. The mural was 7’x 22′ and consisted of over 300 8″ tile depicting an abstract underwater scene. Amelia has continued to make small-scale tile commissions for clients’ kitchens and baths. 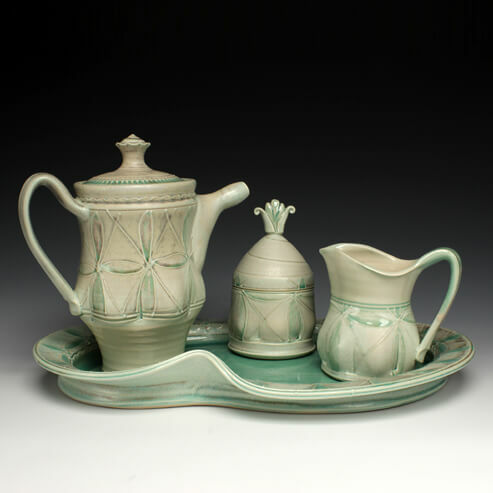 She now resides in Lexington, Kentucky where her husband teaches Ceramics at the University of Kentucky. You can find Amelia’s pottery locally at Junior’s General Store in Danville and the Kentucky Artisans Gallery in Berea. My intent is to make useful objects that challenge the familiar. I strive to make well – crafted pottery that records the transformation of material and process. I use volumetric forms that suggest sensuality in the curves and bends of the clay. Soft celadon glazes highlight the decorative marks that pattern the rich surfaces of my pots. Within this body of work I bring together influences as diverse as woven crafts, antique glass, and the Art Deco period. These influences combine to reveal the decorative language in the details of each piece.